I never knew hummingbirds liked to swing, but evidently they do, because I found a hummingbird swing for sale at our local hardware store. The idea fascinated me. I had never thought about hyperactive hummingbirds ever resting, but they do sit—just not for as long as I do. I showed the swing to my husband and he thought he could make one using materials we had at home. The above picture is one of his products. 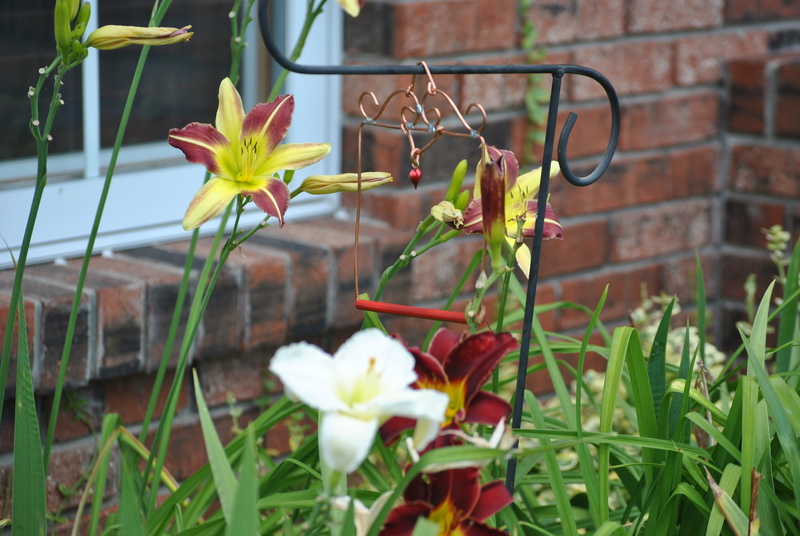 Although No 9 wire would work well, he used copper wire for its ornamental appeal. The wire could also be decorated with paint or an overlay of fine wire. For this swing, the sides of the square are five inches long and the bottom rung (hummingbird seat) is the plastic body of an ink pen that he painted red. A wooden peg or dowel rod would work nicely, too. 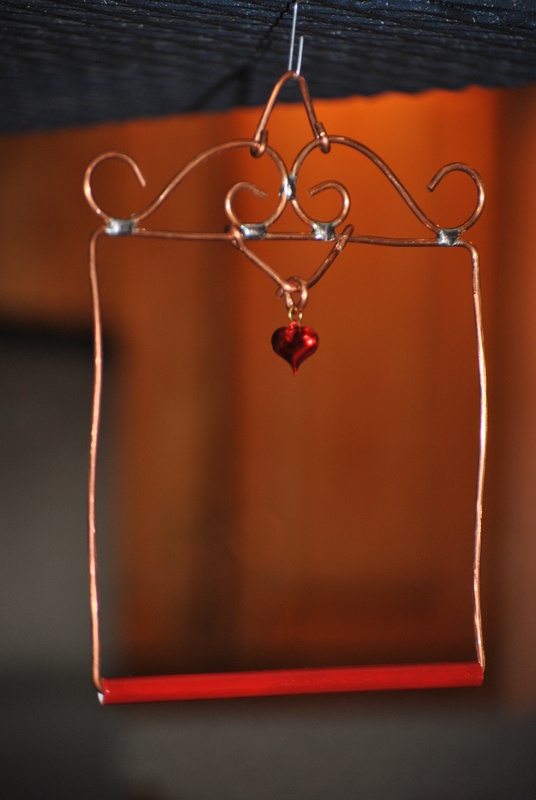 He used pliers to shape the ornamental metal on top of the square and then soldered them in place. The red heart came off of an old pair of Valentine’s Day socks I had. 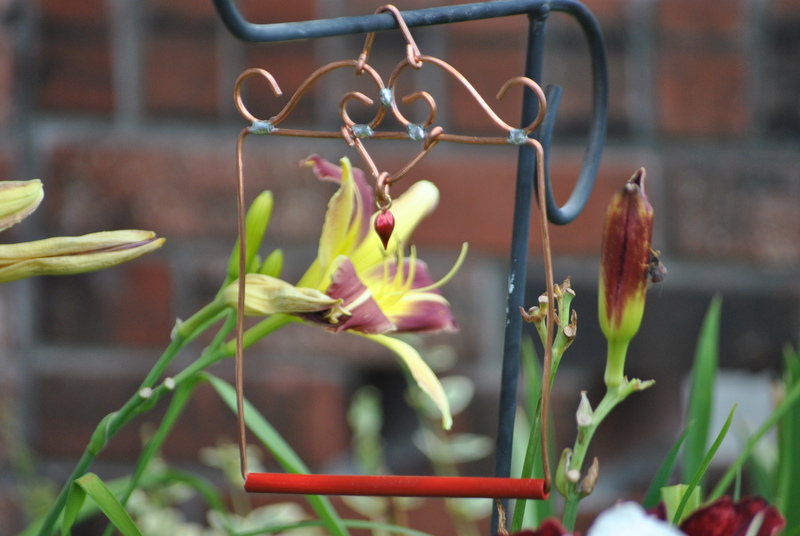 The red ornament is supposed to help attract the hummingbirds to the swing. I also hope you all are enjoying many hummingbird visitors. And if you have a swing, maybe they’ll sit and visit for a while. That looks like a wonderful Christmas gift. Lynn are you taking orders. Yes, I think Santa will be busy in his workshop!